Proteus MMX maintenance and asset management system is a Web-based CMMS/EAM. 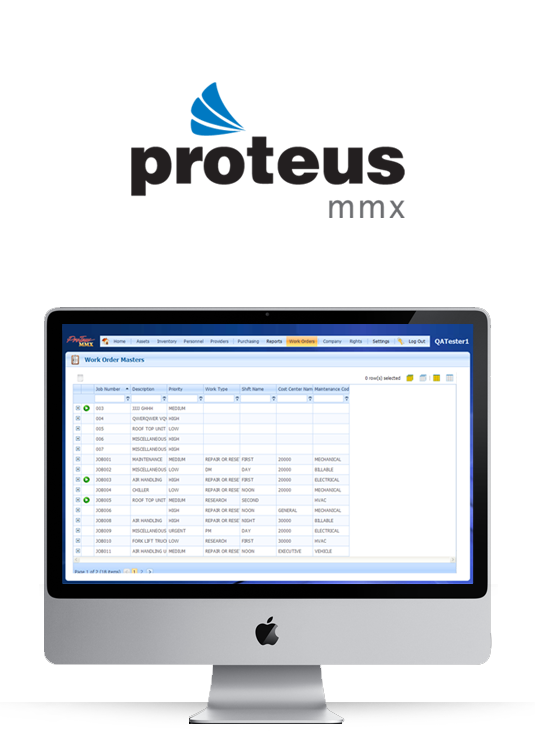 Facilities and manufacturing plants alike enjoy Proteus' robust work order management and reporting capabilities without the hassle of managing client/server systems. Available for rent as SaaS or purchase. Access your asset and maintenance records from anywhere! Web-based - no software to install! The backbone of Proteus MMX is its excellent work order management functionality. Proteus MMX effortlessly handles an unlimited number of preventive maintenance schedules and work order cycles, as well as corrective (demand) maintenance, for all of your equipment. Work orders can be scheduled based on runtimes, date cycle or on an as-needed basis. They can be viewed and accessed via listing format, a calendar interface, report or on a Windows-enabled mobile device, and are automatically activated and printed when due. Proteus MMX is available in two different options. The first option is a hosted version, or SAAS (Software As A Service). With this option, the database is hosted by Eagle Technology and we would perform software updates and maintenance as well as daily backups. The second option is to host the software at your location, on your servers. Either way, the software allows for access anywhere, anytime, and provides a cost-effective maintenance management solution for any size organization. For the end user, this means better control over performance, integration, and security. Proteus MMX is designed to be user-friendly, with helpful QuickLinks, customizable fields to meet the needs of many different industries, a powerful report generator that can filter and sort data in a variety of ways, and a dashboard with KPI’s to display current work order activity, as well as critical information to spot anomalies and monitor trends. Access rights prevent unauthorized actions such as editing of data. An Audit trail module tracks user login and logout, as well as all changes to the database. Approval levels ensure that procedures are followed. ProTeus MMX is fully integrated with popular Building Automation Systems to generate automated work orders upon receipt of alarms, runtimes and/or triggers. Improve your company's asset life and minimize downtime with Eagle Technology's Proteus line of Computerized Maintenance and Asset Management software.